Charles Thomas Pitcher was born on 16 November 1855 in Southwark, London, the son of brewer Isaac Pitcher (1810-1862), originally from Erith, Kent, and his wife, Mary Maria née Harvey (b1821) from Norwich, Norfolk. He was baptised on 23 December 1855 at St Mary Magdalene, Bermondsey. In the 1861 census Charles was listed as a scholar living with his parents and four older siblings at 13 Townsend Street, off the Old Kent Road. The family shared the house with three other families - a total of 16 people. By 1871 Charles, aged 15, was a boarding pupil at the Friends School in Croydon, Surrey. In 1884 he was working as a commercial traveller when he married Ada Helen Thristle (1863-1944) in Minehead. She was the daughter of Thomas Thristle (1831-1890) and Elizabeth née Fish (1829-1887). Thomas Thristle was the proprietor of the Plume of Feathers Hotel in Minehead from 1863 until his death in 1890. Charles was a Freemason and was initiated into Yeovil's Lodge of Brotherly Love on 10 January 1900. 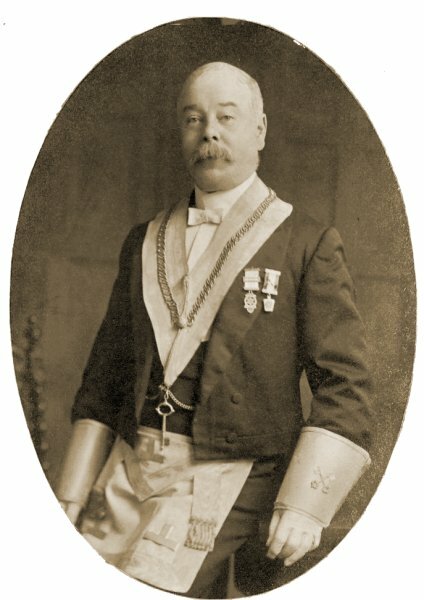 He served as Worshipful Master of the Lodge in 1908. In the 1891 census Charles was listed as a commercial traveller and was living in East Ham, London, with his Minehead-born wife, Ada, their son Charles Thristle (1888-1947) and daughter Edith (1886-1963) as well as Charles' widowed mother, Mary. 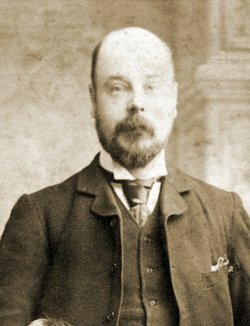 During the 1890s Charles changed career and, using Ada’s experience, became licensee firstly of the Railway Inn, Highbridge and then the Clarence Hotel, Burnham-on-Sea. In 1899 the family moved to Yeovil where Charles became proprietor of the Mermaid Hotel from 1899 until his retirement in 1919. In 1901 Charles and his family were listed at the Mermaid Hotel where Charles was listed as the hotel keeper and they were still listed there in the 1911 census. Charles' final listing as licensee appeared in Kelly's Directory of 1914. Charles' son, Charles Thristle, became a partner in Edward Samuel 'Sam' Ewens' glove manufacturing company of Ewens & Sons which was re-named Ewens & Co when Charles Thristle joined the company. In 1915 Charles' daughter Edith would marry Sam's son Percival. For several years Charles represented the South Ward on Yeovil Town Council. He was a founder member of Yeovil Bowling Club. On retirement Charles and Ada moved to 2 Kilkenny Villas, Taunton, son Charles Thristle Pitcher and daughter Edith Mary Ewens were both living in Taunton at the time. Edith married into the Ewens gloving family in 1914. Her husband Percival Charles Ewens and her brother Charles Thristle Pitcher became partners in the Taunton branch of Ewens & Co.
Charles died on 16 August 1937 at Taunton and his will was proved in October. His estate was valued at £15,857 (around £3.5 million at today's value). Many thanks to Ted Ewens for supplying much of the above information as well as the following photographs. 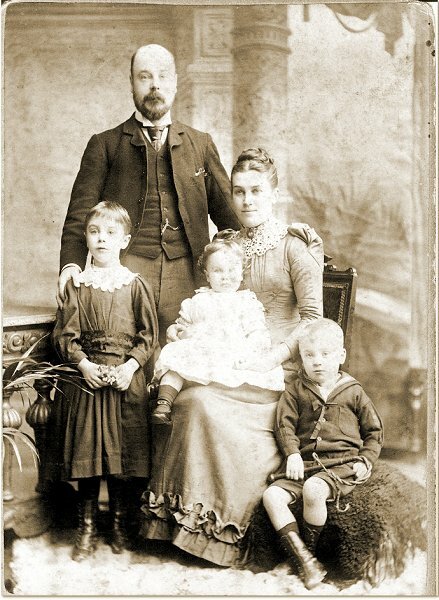 The Pitcher Family in 1894. Charles Pitcher standing. Edith Mary standing in front of her father. Dora seated on Ada’s lap. Charles Thristle Pitcher seated on mother’s left. 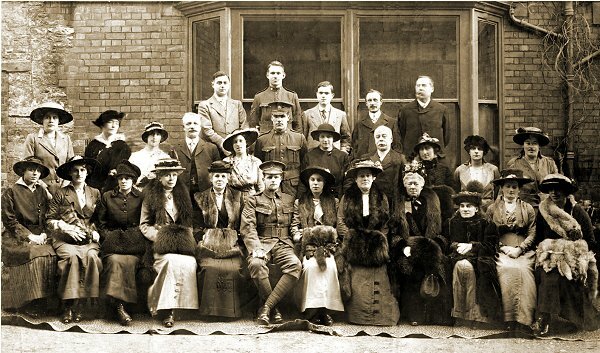 Wedding photograph at The Mermaid Hotel on 27 December 1915. The bride is Edith Mary née Pitcher. Her mother Ada is seated to her left. Her father Charles is standing behind her mother. The groom is Percival Charles Ewens, Sergeant 5th Somerset Light Infantry. His mother Sarah Annie née Hull is seated to his right. His father Edward Samuel 'Sam' Ewens is standing behind his mother. The soldier behind the groom is his brother Lionel Richard Ewens (1891-1917) in the uniform of the 9th Canadian Machine Gun Company. He died at Passchendaele on 26 October 1917. His name is on the Yeovil War Memorial.